Fresh clean looking, really looks great! 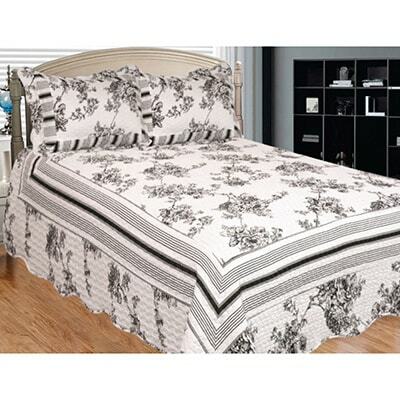 Adorn your bedroom with this timeless black and white toile print quilt set that will bring soft and subtle color to a room. This comfortable, soft quilt set is cleverly put together with a modern stripe to make sure the past and present mix elegantly. This set features a reversible quilt that offers your bedroom a vintage, antique and traditional feel. This quilt is really nice, but for some reason it was a small king size quit it was a little to small for my bed. I ordered a king set, and was a little disappointed that the pillow shams are standard and not king. The shams did not fit the king size pillows they were designated to fit. The first attempt to place the pillow in the sham resulted in a broken zipper! It appears they will accommodate a standard pillow. I will have to buy smaller pillows and a new set of shams to go with the new quilt/bedspread. Just what I wanted. Washed well. "What is the dimensions on the kingsize quilt"